View More In D-Ring Binders. Grab this Office Depot heavy-duty polypropylene D-ring view binder to help make sure all of your paperwork and loose sheets are in place. Interior pockets keep meeting notes and assignments easily accessible. Durable construction and heavy-duty D-rings withstand frequent reference. Covers of D-ring binders are made of nonstick polypropylene for reliable use. Corrugated cardboard adds strength and durability. 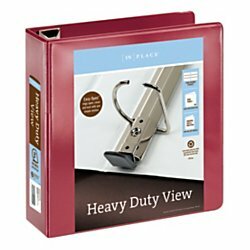 View binders wide front and back binder panels help prevent damage to contents. Designed to fully cover standard dividers and sheet protectors. 3in. rings hold up to 650 sheets of 3-hole-punched paper. Greener choice - contains 54 total recycled content with 53 postconsumer recycled content.